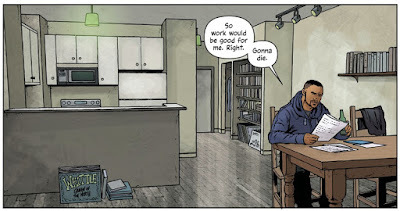 Warren Ellis works in systems comics better than almost any other living comics writer. A systems comic, is a comic that contains a sensibly articulated, and fully comprehendible, seemingly fully-comprehensible, world. Technology, politics, traffic laws and last night’s television that belong not to our world, but to theirs, that seems to work and be built from previous iterations, previous working systems, as an actual history would. 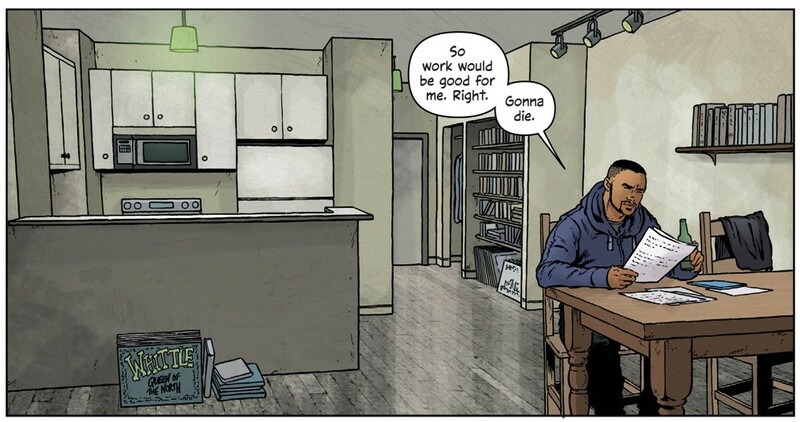 I love systems comics, systems stories, but I don’t like working in the milieu. Maybe, why Ellis is a name you know and lauded the world round, and I am, to date, not. 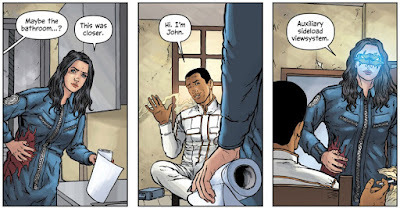 With The Wild Storm, and the capable and careful artwork of Jon Davis-Hunt, Ellis has taken those stripped down human figures and plain rooms, and turned them into a systems comic aesthetic, that makes a whole universe glow with importance and realness, by virtue of its lack of flash. 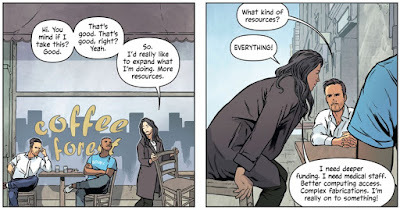 This feels like a refinement of Ellis’ work on systems comics like newuniversal and Transmetropolitan, and a good bit of growth for Davis-Hunt from his earlier work. The WildStorm universe already existed. It has been revised before, folding it into the DC Comics universe, and was created by Jim Lee and associates back in the mid-1990s, but this series has been the narrative equivalent of the visual paring and positioning that I praised above. The original WildStorm universe was wild. 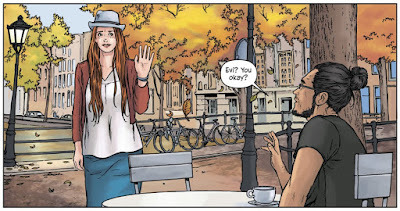 It was visually brash, narratively slapdash, with artists and writers (and artist-writers) laying groundwork that would be almost entirely flipped by other talent a year or two after. It grew crystalline out of a popping, flaring, and chunky soup. It also had more prominent female characters, more prominent non-white characters, or visually-coded-as-nonwhite-but-actually-aliens-or-gods-whatever characters, than comparable major comics universes at the time had amassed in their fifty or seventy years of existing. A lot going on. By contrast, this version seems deliberate, rather than reversals, we have the necessary blooming of truths. The diversity is expanded upon, with deliberate gender-flips of characters from the old WildStorm universe, race-changes, alterations in sexuality. Rather than the speedtrails of high velocity wow, the places and people, aided by a fairly steady nine-panel guide to each page, are articulate necessity; they have to be as they are, and as they are, is real. By the time we are shown more wow, more high velocity flares and high explosive flashes, the real has been delineated and made so true, it is so accepted by us, that the crazy visuals and high concept scifi are real by default of everything we’ve seen being real. The Wild Storm skips over the uncanny valley of splashy fantasy madness by embedding it in a world with generic cafe seating, run of the mill living rooms, and perfectly normal doors. The reader takes in aliens and robots without blinking, not so much because we’re an inured comics audience, but here, because even an alien has understandable body language, even a woman who bleeds out a transkeletal armor with jets on her legs has fear responses we understand. And, none of it looks like it is trying too hard to be convincing. That lack of readily apparent sell, is the best sell the comic can make. While Lee’s original WildStorm launch was all about hard sell, cool scratchy lines and a billion things waving around doing nothing so much as looking goddamn exciting, a woman in a t-shirt on a sofa in front of a blank wall, with a turned off television set across from her does a lot, too, but it does it while sending out a vigorous signal of “I’m not doing anything.” Unassuming. When the people and the places are unassuming, the audience stops making assumptions. We take in passively what would otherwise be impassive information. 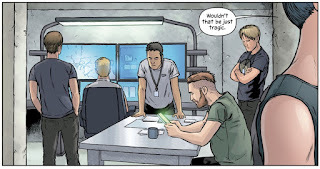 When Davis-Hunt and Ellis want to communicate the actuality of a space that grows between office floors, they just show us office floors and standard jumpsuited employees. Keycard locks and cubicle lighting we already blank on. The added fantastical element becomes immediately so sublimated it simply slips right into our heads. By the time we see glorious, broken alien vistas or interdimensional splash, we understand that their walls probably have water stains, too, that their toilets have invisible fingerprints on the bowl from when someone last vomited there or dropped their phone and bent to retrieve it without thinking where they were placing their hand. Desk lamps will never entirely shine where you want them to, regardless of how bendy they manufacture the necks. The world occupied by people, consists of swept floors and cleaned streets, and those floors and roadways which need, again, to be cleaned. The stucco will have imperfections, the granite signs will inevitably have misprints no one can afford to fix just now, or any time in the five years since the typo was first noticed. This is life. This is society. Culture is our most memorable achievements, but it is also the jokes from last night’s talk shows, that only work in context, but you inevitably try to retell in the morning. Gay men, even hilarious ones, are not arch comedy gays all day long. Drunks don’t inevitably find themselves in an alley every night. A weak smile is not a gut laugh. Spitting mad is not killing rage. We may accidentally wear our t-shirt inside out, your hair is always more perfect at home, than when you come into a shop from across a breezy parking lot. But, if someone has a long red mask hanging from their face and guns strapped to every conceivable part of their body, it is so, because they have made the effort to dress themselves, thusly. Clothes are not always well-considered, but they are almost broadly conscious acts, conscious efforts, by thinking, mobile human beings. 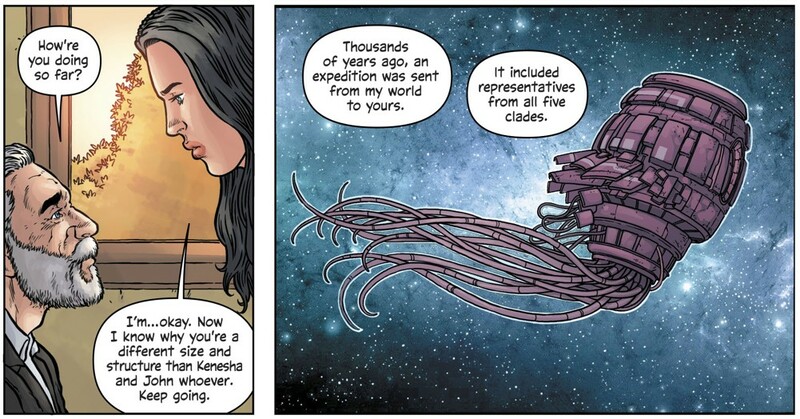 This new version of the WildStorm U, is as much poetry and metaphor as the old. It’s still broadly about style, about seeming. Only thing’s really changed is the style of seeming. Like reality, the world of The Wild Storm does not need to actually work, it isn’t clockwork, it’s a thing that feels and looks akin to clockwork. The look of gears comfort us, because gears are a thing we do know do a job, we know gears work. We know governments do something, so if you have one, it feels like a fixture, a job-doing occupancy of a necessary cultural gap, which would be, otherwise, a vacuum. Audiences abhor a vacuum. We are agitated by gaps and secured by familiar presence and the sort of reassurances that real life rarely, if ever, affords. Flashy scifi people will use tablets, much like the ones we use, even if they can have a transparent device or blow up their visual on some three-dimensional glowing array that surrounds them, because, for first, those things are impractical to the point of being a detriment, and second, the tablets we use are crazy science fiction devices far in advance of the same branch of technology even in mid-90s Star Trek. The elevator was still showing up in Star Trek: The Next Generation, as a form of high technology. Having an artist and a writer who understand these truths, and who can machine them into something impactful, something misleading in the best possible fashions, is, itself, a kind of good magic. We pay for the privilege of being briefly misled through an interesting trip. We want the huge fights, the rockets and smart bullets, the jetpack legs, but when it’s all clean and clear, it looks too fake. Too clean. When good people look too much like cartoons of good people, we stop believing, no matter their actions or their words. A world that has leaves fallen in the street and rockets firing in space, a world where alien robots wear people-disguises and sometimes your sleeve sits funny on your arm, is a world we can swallow. If we can see the inner guts of a Star Trek vessel or the deeper bowels of Heaven, but have the outs of oh, elevators and tablets, or, oh, drugs, we are secured. We are strapped in, but strapped into a comfortable seat, in a familiar cockpit, on a commercial flight. And, we trust commercial. We believe in Starbucks. And, if there are aliens at Starbucks, they are, before they are aliens, aliens at Starbucks. The place, the familiar people and places, anchor and comfit anything else.